This post is part of the series Partner Profiles, where US2020 RTP shares the story of how our nonprofit, corporate, school, and university partners are contributing to a STEM education community of practice. For this Partner Profile we interviewed Kelly Witter, the Director of STEM Outreach at the US EPA in RTP. Kelly has been with US2020 RTP since the beginning, helping to recruit mentors and streamline STEM outreach in the Triangle. She also recently led a demo and a tour for the RTP STEM Expo. Why does the EPA think STEM outreach is important? STEM outreach is part of the EPA’s mission to protect human health and the environment. Additionally, a tenant of environmental education is that, in order to get kids to protect the environment, you need to get them to appreciate the environment. We also think it’s important to prepare and inspire the next generation, so we do STEM and environmental education in hopes that someday some of these students will be in a STEM career. What makes your employees excited about doing outreach? Making a difference. You might go into a classroom of 30 kids and you might connect with one kid or all 30, but no matter how many kids you connect with, you make a difference. I also try and let employees know that it helps develop their communication skills. Oftentimes, employees might be used to writing in peer reviewed journals or presenting to PhDs at conferences, but this is a personal development opportunity to present your work in everyday language. It also breaks up your day and makes your day different. One of the things that I love about my job is that every day is different. What activities get students the most excited about science? The activities that get students the most excited about science are the low-tech ones. I’ve been doing this for almost 12 years, and when we first starting going out to career fairs and science days, I would feel like our props were pretty “lame” and low-tech, but I’ve learned that our simple activities done with everyday objects that kids recognize are really the most engaging. Kids generally get enough, if not too much, tech stuff so I actually try and get away from doing things online. One of our favorite activities for older kids is a board game called the “Energy Game” where students try and come up with the best energy mix for a community, not only to keep costs down but to try and reduce CO2 emissions and reduce the impacts of climate change. The activity was developed based on real research that our scientists are doing at RTP. Another favorite activity is called “trash talk” where we give students three bags of trash and they sort through to see what can be reused, repaired, and recycled. In most groups nothing ends up in the trash. 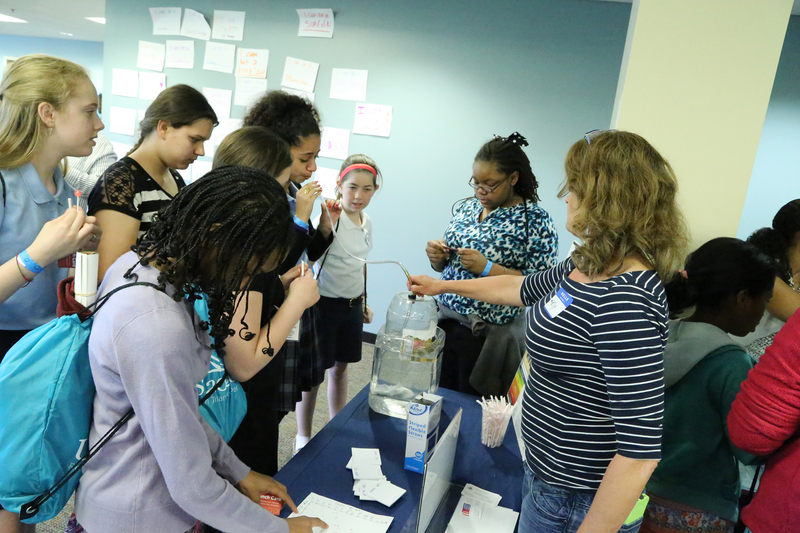 You recently led a tour for the RTP STEM Expo, what did kids see when they got to the EPA? They got to come in and see security and what it’s like to work in a federal building—kind of like airport security without the flight. One of the things that gets students excited is our employee store, and we tell them is that the store is there so that employees can save fossil fuels from driving off campus during the work day. The main part of the tour was going up on our roofs and seeing our thin-film solar panels, which students actually get to touch. What advice would you give to a STEM professional who wants to be a mentor? My advice would be to work with kids on what you are enthusiastic about. It could be what you’re working on now, it could be what you worked on in college, it could even be a hobby. I would also say don’t be afraid to make mistakes and be flexible. I’ve learned more from my mistakes than from when things go as planned. Realize that every presentation is not going to be perfect, but that’s okay. You’re not going to catch every kid every time, if you can make a difference for just one student that’s pretty awesome.